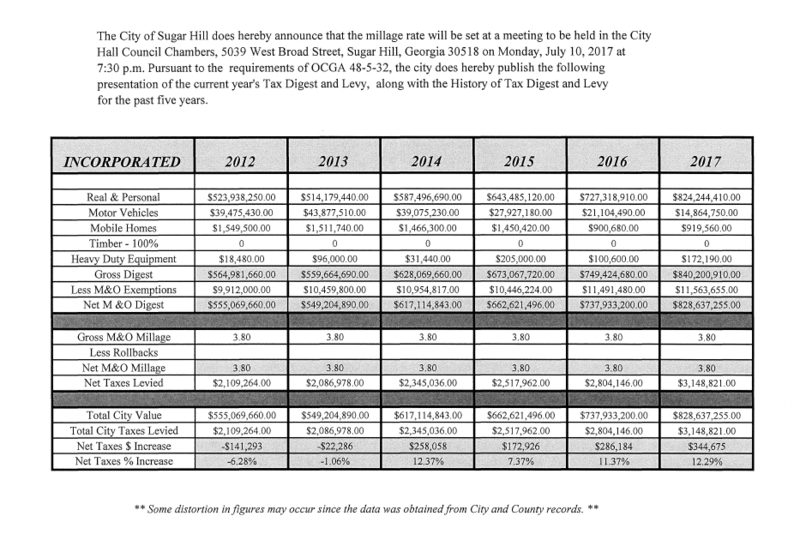 The City of Sugar Hill, Georgia has tentatively adopted a millage rate of 3.8 mills for 2017, which will require an increase in property taxes by 6.20%. Without this tentative tax increase, the millage rate would be no more 3.578 mills. All concerned citizens are invited to attend the Public Hearings to be held at City Hall, 5039 West Broad Street, Sugar Hill, Georgia on the following dates: Monday, July 3, 2017, 10:00 a.m., and Wednesday, July 5, 2017,6:00 p.m. The Mayor and Council will meet at the City Council Meeting on Monday, July 10, 2017, at 7:30 p.m. to hold the third Public Hearing and set the 2017 Millage Rate.